Providing a step-by-step guide to Yoga Nidra, Pierre Bonnasse offers a full range of practices focused on the time of awakening and that of going to sleep, yet adaptable to any time of day or night. He details the simple postures of Yoga Nidra and includes preparatory techniques that work with breath and guided meditations to help you become an attuned observer of your inner world. 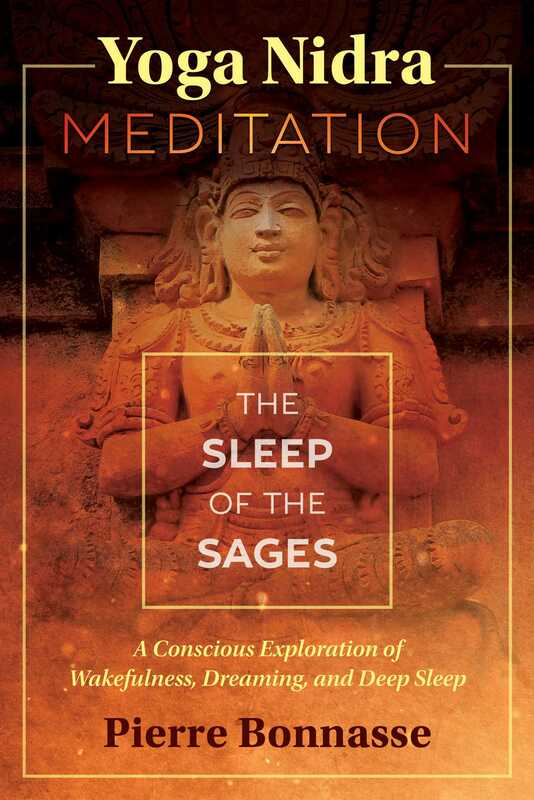 Offering tips for withdrawing the senses and maintaining awareness in the liminal state that precedes sleep, the author explores how all practices in this discipline begin with a phase of relaxation and observation of breathing, followed by immersion into a very subtle awareness of the physical, energy, and mental bodies. He explains how Yoga Nidra sessions allow you to discover “that which is held on to,” making it is easier to let go and become free from all states and processes. A session can explore different states of consciousness as well as your senses, desires, and fears. The higher states of more advanced sessions focus on the energy body and its components: the chakras, nadis, and pranavayu, the vital breath and autonomic functions of the body. “It is necessary to be awake all day long, in order to sleep well,” Nietzsche wrote in Thus Spake Zarathustra. In the context of Yoga Nidra, this affirmation takes on a new meaning and is a teaching of great importance. And we can also add that it is up to us to sleep well at night, in order to be truly awake. Yoga Nidra thus offers a path of relaxation, inner knowledge, discharge, regeneration, and opening up to spaces free of suffering, be it in wakefulness, in life, in sleep, or in death. By invading the unawareness at the source of all conditioning, Yoga Nidra allows for a new outlook on the world, on others, and on oneself, an outlook that is more peaceful. With regular training on a daily basis, the practices fall into place on their own, even at night. Everything is clear and luminous. A new flavor that changes life, our way of knowing ourselves and of being. The philosophy is essentially practical. The knowing and the being are reunited in a harmonious, benevolent, and nourishing dance. The map is not the territory, but allows us to move forward on the path, to lose ourselves then to find ourselves; it lets us be seized by what is neither lost nor found. I can relax without practicing Yoga Nidra, but I cannot practice Yoga Nidra without being relaxed, just as in meditation. In wakefulness, the relaxation essentially operates on the level of the physical body and its tissues. If I am not relaxed and am completely tensed, it is impossible to be aware of the profound structures and of the energy that circulates in them, neither during the day nor at night. Whereas, in the practice of conscious sleep, the deeper the relaxation, the more available and open I become. Even though it is only a preparatory phase, it is still very important, because perceiving the tensions allows me to let go of them and awaken to a space of consciousness that is ever peaceful and tensionless. The different processes are observed peacefully. The transition and intervals are observed and the enquiry continues: Who am I? Sensations appear and disappear inside me, so I am not this tensed or relaxed body, healthy or sick. Emotions appear and disappear in me, I am thus not these changing emotions. Thoughts appear and disappear in me, I am thus not these thoughts. To whom do these thoughts appear? The only possible answer would be “I AM.” In the light of this witnessing-presence, the ego, the “I thought” suddenly appears to be a simple tension of the mind, the crystallization of a thought that belongs to no one, a knot that lacks firmness, and a contraction that no longer exists once it is released, as in the heart of deep sleep, meditation, or “conscious sleep.” But it is necessary to remain alert because the states are changing and the tensions may come back, without me noticing them. With practice, Yoga Nidra--as a reality and not as a means--reveals itself to be the ever peaceful background of all my activities and all my experiences. Conscious or unconscious, being or not being, tensed or relaxed, asleep or awake, all these dualities end up dissolving into that which is neither this nor that. No form of yoga, as a technique or a practice can allow me to realize the Self, because realizing the Self is not an action. Yoga Nidra, on the other hand, can make me available to such a discovery by familiarizing me with the non-Self and awakening me to a different quality of listening. Through the total commitment and conscious effort that are required against the mechanical manifestations of my person, it produces the friction through which non-effort sets in, like a transparent and clear truth, vibrant and luminous all at once. When all concepts are dissolved, the yogi is thus effaced in the transparent benevolence of his true nature that is the same Consciousness in all of us, the unique underlying Force in each one of our multiple eccentricities, and the Life at work in each one of our cells. As in all traditional paths, Yoga Nidra invites us to realize, by simple observation, that we are not the bulb, but the electricity, and that the electricity is the same in each bulb, and moreover, that electricity does not die when the bulb goes out. But, as soon as there is light, the bulb easily tends to think that the current comes from it and that it is producing the light. I must be very alert to not get caught up in the illusion of the “me” that latches on and gives itself credit for everything, if it reappears. If I can experience the peace, the silence, and the void, it means that I am still beyond this sensation or feeling. However, one must not be deluded by a false sense of liberation and be fooled by such periods of silence and thought. On the contrary, it is at this moment that one must become alert again, and look inside with a lot of attention to realize who experiences this silence. For there is no beginning and no end to the silence of the Self, which never changes. Only thoughts appear and disappear. It is not enough to simply stop thoughts in order to be free; it is absolutely necessary to recognize their source.